Create and customize your own character with clothes, accessories, locker decorations, and more! Exciting and intuitive mini-games using the stylus such as dancing and singing with Tori! When you're a student at one of the top performing arts high schools, the only way to fit in is to stand out. It's your time to shine with Tori Vega and her friends as you complete challenges, collect items from the show, and develop your talents as a member of Hollywood Arts. 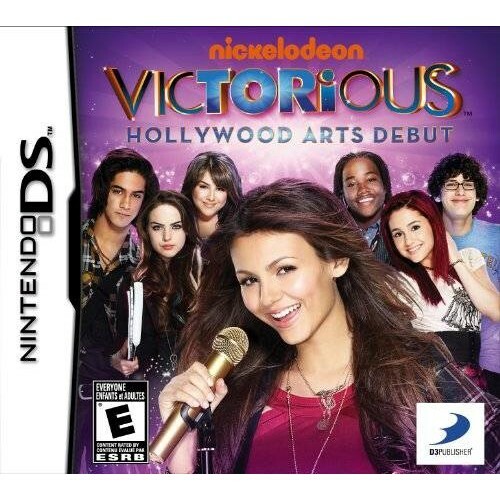 • Victorious: Hollywood Arts Debut for the Nintendo DS allows players to dive into the show's fun Hollywood Arts High School world, create their own character and experience classes and funny situations in the form of dynamic, replayable mini-games. 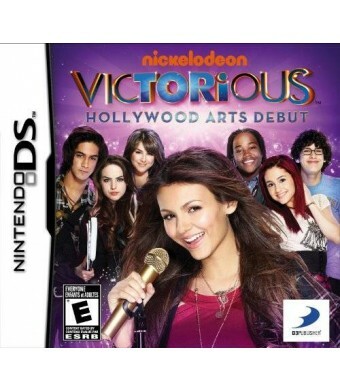 • First of its kind, based on the hit live-action comedy series - The video game is based on Nickelodeon's hit show, Victorious. • Reach Hollywood Arts stardom - Players will feel as if they are a student at Hollywood Arts High School and the game includes the voices of the Victorious cast, including Victoria Justice, who stars as Tori Vega. • Be the next superstar while enjoying hours of gameplay - The game is loaded with mini-games, activities, hit songs from the show such as Freak the Freak Out and Beggin' On Your Knees, and players can even wear the same outfits as Tori Vega and the cast. Explore Hollywood Arts and find hidden items and unlockables around every corner. About the GameVictorious™: Hollywood Arts Debut is based on Nickelodeon's hit live-action comedy television series, Victorious. It offers players the chance to interact and fully experience life in the elite, Hollywood Arts world as a new student. Players take part in crazy adventures while becoming friends with Tori and all the stars from the show.